Australia has released Balance of Trade and the US will publish Factory Orders MoM and Continuing Jobless Claims. 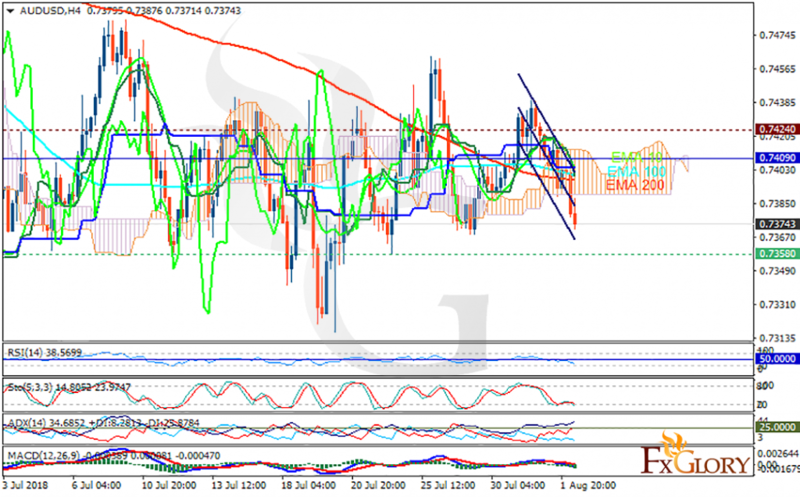 The support rests at 0.73580 with resistance at 0.74240 which the weekly pivot point at 0.74090 is located in between the lines. The EMA of 10 is moving with bearish bias in the descendant channel and it is above the EMA of 200 and the EMA of 100. The RSI is falling towards the oversold area, the MACD line is below the signal line in the negative territory and the Stochastic is moving in low ranges. The ADX is showing sell signal. The price is below the Ichimoku Cloud and the Chinkou Span. The Tenkan-sen is showing a downward trend while the Kijun-sen is showing a horizontal trend. AUDUSD may continue its decline towards 0.731 area but then the bulls will take the control of the chart.